PHU QUOC, VIETNAM—Ba Sao Audio recently deployed complete HARMAN Professional Solutions audio and lighting systems at the Rock Island Club at the Nam Nghi Resort. 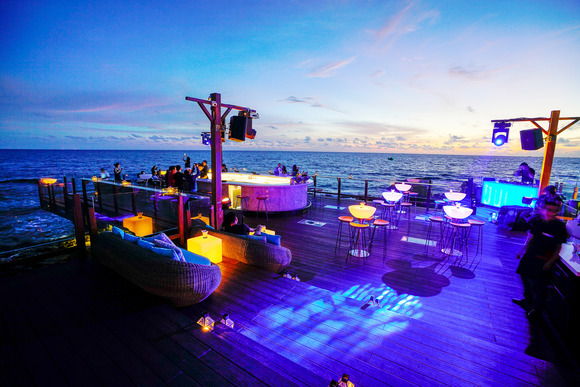 Located on a small private island offshore from Phu Quoc island, the Rock Island Club is an outdoor eating, drinking and dancing venue that offers a 360-degree panorama of Phu Quoc’s beautiful coastline and a mesmerizing ocean view. The club is renowned for its team of mixologists and chefs, who craft innovative cocktails and provide a contemporary culinary experience. Management recently decided to upgrade the sound and lighting with the intention of turning the Rock Island Club into an international party destination. To achieve this goal, management hired Ba Sao Audio to design and install a complete HARMAN audio and lighting system made up of JBL, Crown, BSS, Soundcraft and Martin solutions. The HARMAN system includes JBL Control 31 two-way loudspeakers, which are paired with JBL PRX418S subwoofers to reinforce the bottom end. The system is powered by Crown DriveCore Install and CTs 2000 amplifiers. Audio processing is provided by BSS Soundweb London BLU-100 and BLU-50 signal processors, and a BSS Ethernet controller is used for signal routing. Audio is mixed on Soundcraft Signature 16 consoles. The lighting solution features numerous Martin by HARMAN fixtures, including the RUSH Aqua compact LED, the RUSH Wizard "full-house" effect light, and the RUSH Multibeam 2 LED effect light.